Product #1282 | SKU EFS1585IS | 4.0 (based on 1 rating) Thanks for your rating! Durable Digital lens with UltraWide Zoom. With 84° to 18° angle-of-view, the Canon EF-S 15-85mm f/3.5-5.6 IS USM Lens offers excellent wide angle to telephoto focal lengths with Canon APS-C EOS Digital SLRs. Canon's Ultra Sonic Motor (USM) technology enables fast and quiet focus control with on-demand manual override when shooting in AF mode. 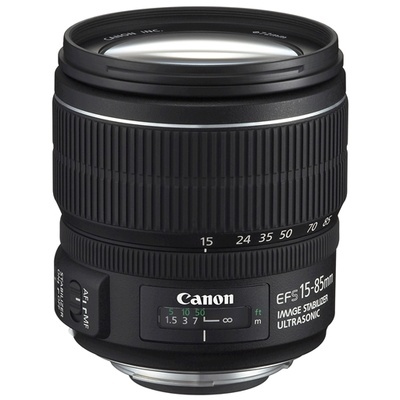 As with all Canon EF-S optics, the Canon EF-S 15-85mm f/3.5-5.6 IS USM Lens is designed to deliver optimum sharpness edge-to-edge when used with Canon APS-C format DSLRs. This was my first lens purchase outside of the kit lenses. The clarity of the images I am able to take with this lens is brilliant. It is heavier than the kit lenses but still great for walking about with. Only niggle is it tends to have a bit of lens creep when out and about.